Adolescents have it particularly tough in the zombie apocalypse. Everyone around them is obsessed with survival–which is certainly understandable–but every ounce of a teenager’s instincts is pushing him or her toward goofing off. The psychological toll of burying your most basic desires must be exhausting. Left Behind presents this unique point of view through Ellie, the extraordinary heroine from The Last of Us, and it’s hard to resist laughing along with her when her childlike nature is on full display. Don’t expect this prequel to ignore the dark cloud that hovers ominously overhead, though. By examining Ellie’s plight through the lens of such a bleak existence, we grow ever closer to her, and realize how devastating one’s life in such a world would be. Riley sneaks into Ellie’s room before the sun rises, pouncing upon her sleeping body while mimicking a hissing neck bite. Obviously terrified that an infected is eating her alive, Ellie tosses Riley to the ground before pulling a knife from beneath her pillow. Jokes aren’t quite as funny when there are monsters lurking. We soon learn that these two best friends had a falling out a month back, and while Ellie is going through training in a military school, Riley has joined the rebel Fireflies. Grievances quickly forgotten, the two risk punishment from their superiors by sneaking into the dangerous city they call home. There’s a relaxed back-and-forth between Ellie and Riley that’s a marked change from the uneasy chatter that dominated The Last of Us. Ellie is playful and open with Riley, always ready with a quip and eager to experience everything that life has to offer. A few years older than Ellie, Riley soon takes charge, though her direction is subtle. She’s more of an older sister than a guardian. Their destination: an empty mall without any electricity. Or so Ellie thought. When Ellie flicks the power generator, the lights come on, and the two girls are free to explore the shattered remains of what was once a rich and wasteful society. Watching these two characters interact is heartwarming. 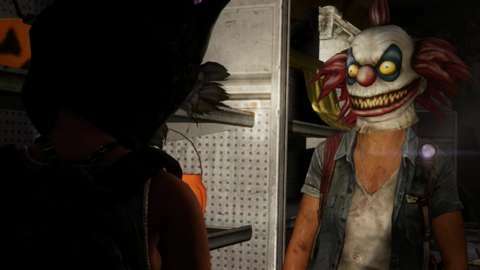 As they try on masks in a Halloween shop, their joy is infectious, and I was nodding along with Ellie when she remarked how much junk people used to buy. Such bric-a-brac must be difficult to understand if you live among people who cherish only the bare necessities. Still, Ellie doesn’t turn her nose up at the novelties around her. As you wander through that store, there’s a Magic 8 Ball that looks like a skeleton’s head. Sure, you could shake it just once if you’re in a hurry, or bolt right through the door to the next area, but once I realized that Ellie had a lot of questions in mind, I kept going back to it until she ran out of things to say. Such moments made me happy. To see Ellie in her own element, acting like the kid that she still is, was so real and genuine that I didn’t want to see it end. By examining Ellie’s plight through the lens of such a bleak existence, we grow ever closer to her, and realize how devastating one’s life in such a world would be. Much of Left Behind is composed of these playful scenes, but there’s more going on beneath the surface. As you explore the many stores of the mall, Riley and Ellie keep up a running dialogue. Having the emphasis placed on wandering around the desolate environments is a welcome change from the tense combat encounters that dominated the main game. The focus is primarily on getting to know Riley and understanding more of Ellie’s motivations, so it’s a relief not to have their bonding interrupted. You want to know more. You want to find out what caused them to fight, what Riley’s future plans are, and how they’re coping with their depressing reality. It’s here that Left Behind more closely resembles the mood that permeated The Last of Us. Ellie lives in a terrible place where every living thing could be considered an enemy. Death is her only companion, always painfully present as she moves slowly through the tattered environments. Going between the lighthearted early days and the foreboding doom years later is so jarring that it’s almost too much to bear. When she’s with Riley, Ellie laughs so loudly that I would hold my breath, scared that a clicker would hear her. Even though no infected were around, I couldn’t forget their terrible wrath. She’s so young, so naive, that she hadn’t yet learned to be cautious at all times. And when you’re alone in the sections without Riley, you feel the weight of the change of the last few years. Now she realizes that death is one loud noise away. I wanted her to stay young forever, ignorant to the threats lurking, while understanding that she needed to grow up fast if she was going to survive. Of course, such different mindsets are impossible, and I was sad to see how quickly her carefree disposition was ripped away. So I cherished those scenes with Riley and Ellie. When they happen upon a photo booth, they make faces and shriek giddily when their silly mugs are captured. But they can’t print out the pictures. And that goes along with the major theme of Left Behind. We see a brief, happy snapshot from Ellie’s life with Riley, but we can’t take it with us. Her childhood has to come to an end at some point. Everyone young girl should learn how to use a Molotov cocktail. When you’re playing as Ellie alone, there are threats around you. There are no jokes here, nothing to distract you from the dour proceedings. When the first fight erupted against the zombie menace, I recoiled. Extreme violence was the norm in The Last of Us, but after spending so much time in peaceful tranquility in Left Behind, I had forgotten how harsh this world was. And I hated that Ellie had become accustomed to her role so quickly. Though Ellie must kill many times during the course of this three-hour story, it’s always uncomfortable. It’s never accepted that this is just the way things are. It’s to the game’s credit that you’re placed on the defensive in combat. Ellie doesn’t want to fight–she has to–so you reluctantly kill your foes because that’s the only option. I was sad to see how quickly Ellie’s carefree disposition was ripped away. Still, it’s disappointing that one section can be completed only when every enemy has been exterminated. As the fight was wearing down, a few zombies were quite a distance away, well out of sight, and yet I could not open the door that stood locked before me. Forcing Ellie to systematically kill everything felt dirty, as if the game were pushing Ellie down a violent path that’s opposed to who she is during the somber cutscenes. Or at least who I wanted her to be. 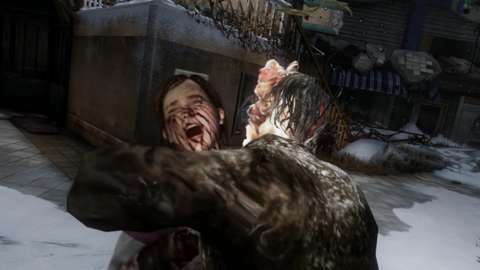 In many ways, the fights are identical to what The Last of Us offered. The crumbling wasteland of the postapocalypse serves as your battlefield, and you must make smart use of the overturned tables and smashed windows if you’re going to survive the stalking threats. Ellie is quick with a bow and pistol, and can craft smoke bombs, nail bombs, and Molotov cocktails if you need something more explosive. The most important items aren’t traditional weapons at all; rather, they’re bottles and bricks. Ellie has little health, and there aren’t many items scattered about to craft a surplus of medical packs, so you need to stay out of sight. That’s where the bottles and bricks come in. Instead of letting your position be known by firing a gun, you can stun infected and humans by tossing an object at their face and then rushing in to finish them off with a knife. Disturbing? No doubt. But very effective. There is one addition to the combat that fundamentally changed how I approached fights. 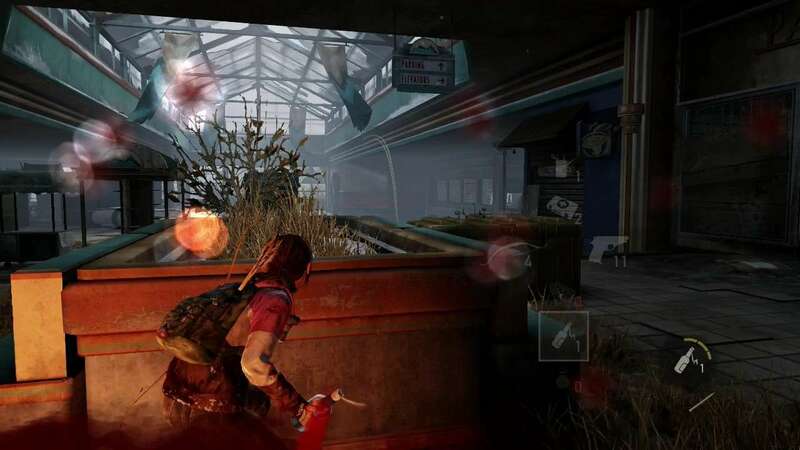 In The Last of Us, zombies and mercenaries never mingled. Here, the mercs may be in for an unpleasant surprise when they’re hunting you. You see, infected don’t like any humans at all, so they’re just as happy to go after a gun-toting soldier as they are a teenage girl. If you toss a bottle toward the armed guards, you can draw the attention of the diseased monsters, and then watch from a safe distance as the two sides fight. I admit that I found pleasure in hearing the mercenaries cry for help when surrounded by infected. They were trying to kill Ellie, after all, so they deserved a violent end. Plus, the mercenaries would undoubtedly kill at least some of the infected, so it made my job much easier once their fight was over. Left Behind is a hugely successful add-on to The Last of Us. When I played through the main game last year, I had trouble connecting to Joel, because his rough demeanor and questionable choices left a bitter taste in my mouth. So it was a relief that his desperation was nowhere to be found in Left Behind. Instead, the story focuses on love and hope. Seeing how Ellie acts with a peer, a friend, gave me new appreciation for her, and Riley offers another strong character to latch on to. The focus on exploration also lets the well-realized environments breathe, and gives you plenty of time to take in the current state of the world. And when a combat encounter surfaces, it’s so much more impactful considering how rare fights are and the exhausting tension that accompanies each battle. Left Behind is an excellent addition that gives further insight into the chilling world of The Last of Us and its most interesting character. Tagged Behind, Last, left, Preview, Review.